Following our cycling exploits to Risoul and Ceillac in the Queyras Regional Park, we were eager to get back on our bikes again today and explore this beautiful area a little further. However, rather than target one more of the Tour de France monster climbs nearby, such as the Col d'Izoard or the Col d'Agnel, we were feeling in the mood for a more even ride, which is a little tricky since our base is in the French Alps! Fortunately the road along the Guil valley, which extends from Guillestre right into the heart of the regional park rising gently along the picturesque River Guil, provided us with the ideal terrain and backdrop for a relaxed and invigorating ride. With excellent road surfaces and mostly shallow gradients the kilometres just flew by as we gazed on distant peaks and nearby river rapids. The river Guil has its source at the foot of the Mount Viso which at 3841m is highest summit of Southern Alps. Our route today started on the now familiar road from Guillestre heading east into the regional park following the precipitous and occasional overhanging road into the valley mouth to reach the Pont du Pierre/Maison du Roi reservoir. The last time we were here we had forked right to Ceillac, but this time we continued left to stay by the side of the river. The route we were following along the Guil river at this point is also part of "La Boucle d'Izoard", a 96km loop over this monumental col that contains more than 3000m of climbing in total! Phew. Fortunately for us we were just content to enjoy the sweeping views of the cascading clear waters of the river and slowly tick off the kilometres as we gently climbed at around 2 - 3% gradient, with occasional sharper sections at between 6 - 8% although these never went on for more than a kilometre or so. With the river always within touching distance we could see plenty of canoeists and rafters braving the rocky flow, including some who cheered us on (Allez, Allez...running alongside us Tour de France style). The surrounding mountains also added to the drama, at times distant and lofty across wooded plains while at others hemming the road in tightly between sheer cliffs. It was stunning and also moving as we cycled past a war memorial commemorating local people who had lost their lives in various conflicts. After around 20km of riding we passed the foot of the turn to the Col d'Izoard where plenty of road cyclists were mustering, but we continued on the steady climb to reach the fortress town of Chateau Ville-Vielle with its imposing 13th century Fort Queyras prominent on the skyline. Passing through the tiny streets with ancient houses on all sides it was easy to imagine a world centuries ago with people struggling to make a life in this remote place. After Chateau Ville-Vielle the valley opened out once more as the sheer cliffs moved away and the river now cutting through a shallow valley bowl. We passed the foot of the climb to Col d'Agnel heading south out of Ville-Vielle and pushed on further east, going through the town of Augilles and climbing steadily all the way. By this time the sun was reaching its afternoon peak and we began to feel as though we were cooking on all sides with the heat from the road glaring up at us. We had ridden a shade over 30km all uphill and although the signs to Ristolas and the valley head seemed tantalisingly close, we opted to start our return journey. Pausing in a store just outside of Chateau Ville-Vielle we collected a box of frozen cherries and found a spot by a fountain in the shadow of Fort Queyras to enjoy their sweet coolness before cruising further down the valley again. Despite a stiff headwind we found the downhill gradient more helpful than we had expected having not fully appreciated just how much we had climbed (around 600m in the day) and in what seemed like no time at all we were back in Guillestre (I think the return journey took about a third of the time of the outward). Sweeping around corners and past the overhanging cliffs once more it was hard not to shout out loud at the sheer joy and elation of being in this place at this time. We both felt fantastic. Later, back at the camping we both reflected on the ride as one of our best ever. Sure, we'd tackled longer, higher and steeper rides. But almost like no other ride we had relaxed so completely into the journey without the stress or struggle of a never-ending, lung-busting effort on top. All we had had to do was sit back, spin our legs and absorb the energy of nature. 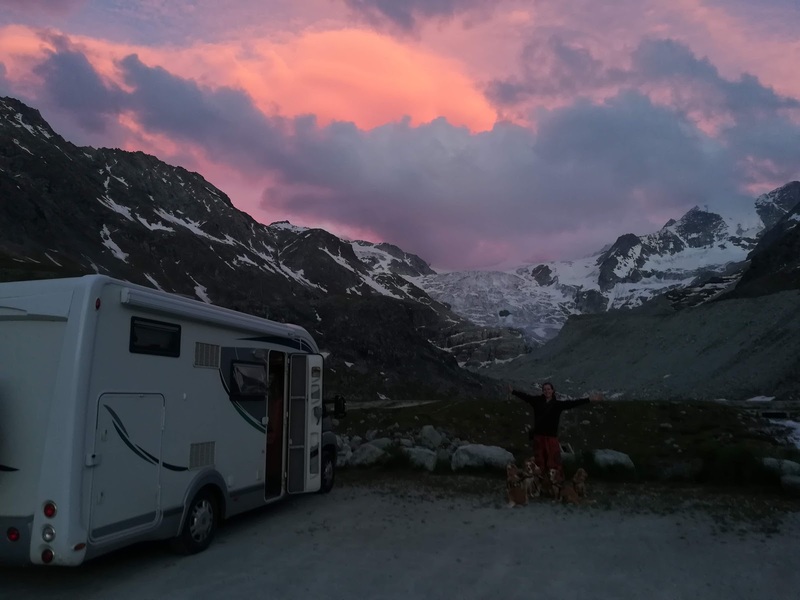 It was two very happy motorhome adventurers that went to bed contented that evening (after another dip in the river to cool off of course).